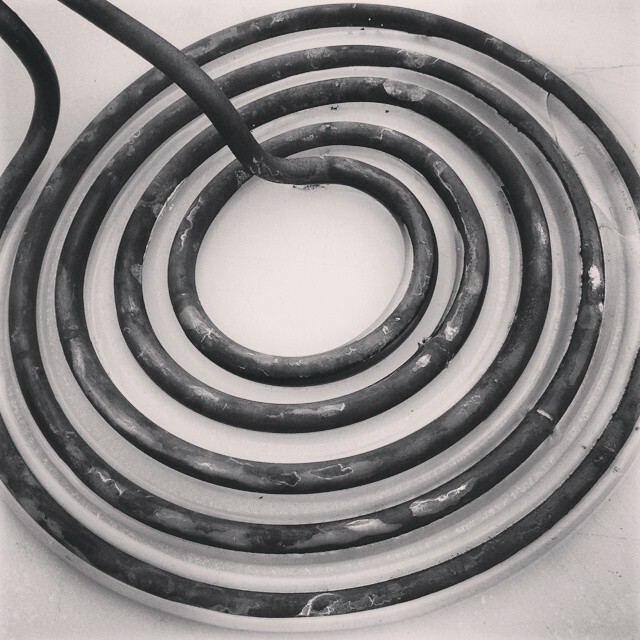 Burner Ring. Unfortunately fused to a plastic cutting board, but it’s the right shape. You can guess why a ring-shaped foods themed dinner menu in the days after the Supreme Court ruling on marriage equality. The world is full of Lifesaver Cocktail recipes, all of which I believe would be appropriate with a Lifesaver garnish. There’s a Cherry Lifesaver Shooter, Butterscotch Lifesaver Cocktail, Raspberry Lifesaver, Cherry Lifesaver Martini. . . I could go on, but it pains me. Breakfast cereals have famous ring shapes, including Fruit Loops, Apple Jacks and the entire Cheerios suite. Momufuku Milk Bar is famous for using cereal in desserts (and they share their recipes in a cookbook and online). Serving their Cereal Milk Ice Cream with a ring-shaped cereal topping would not be a bad idea . . . it would also resemble my breakfasts in college. 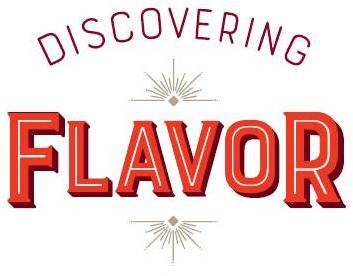 For a savory cereal option, try a Cheerios Snack Mix. Bagels. Obviously. And lucky for us, The Kitchn has this Top 10 list of delicious bagel spreads. Braided pastries are classic to pull into a ring shape. Here’s a savory one with Spinach, Feta and Pine Nuts from Artisan Bread in 5 Minutes a Day (which, honestly, looks a lot better than the one I make so I’m linking this recipe instead of mine). Onion Rings – A classic. If producing for a crowd, it’s a lot simpler to do an oven baked variety, even if the results aren’t exactly the same. Here is a recipe from the Food Network – I use Panko Crumbs instead of potato chips. Onion Rings not enough vegetable for you? Leeks sliced the short way across also pop out into rings. If you’re getting into the Panko thing from above, here’s a Food52 braised leek recipe with crispy topping. Or, here is an Alice Water’s recipe for braised leeks with duck legs. Scallions and chives sprinkled randomly across dishes can work in a pinch. Calamari Rings – The best ring shaped food, in my book. I personally like them sauteed with lemon, parsley and pickled cherry peppers, which is a wussy version of true Rhode Island style calamari (a recipe for which is here). Tortellini – Tortellini are an artsy, asymmetrical ring – way classier than the Spaghetti-O’s option. I like any recipe involving tortellini and sugar snap peas. Here’s one from Better Homes and Gardens. 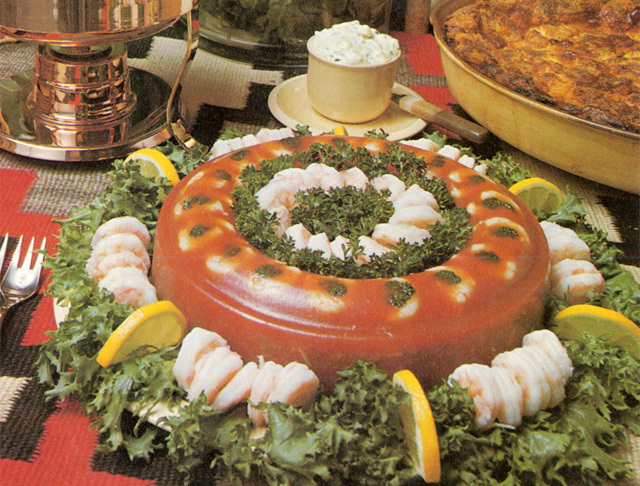 Bloody Mary Shrimp Aspic Mold from a Bon Appetit round up of vintage mold recipes. Many rings there. Ring shaped desserts are legion. There are breakfast cereals, as noted at the beginning and here’s a whole page on transforming those Cheerios into dessert. And there’s Angel Food Cake. Anything in a Bundt pan. 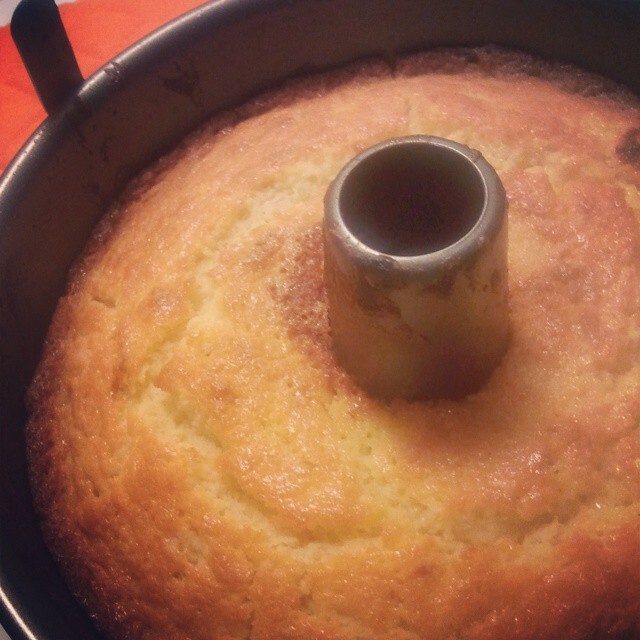 . . .
. . . and we cannot neglect the doughnut – a classic ring shaped dessert or breakfast item in case your dinner party should carry on through until the morning. Convenient, no? If you want to clear up any dessert / breakfast confusion, add a scoop of ice cream (although, as previously stated, that would still qualify as college breakfast). My favorite recipe is this one for apple cider doughnuts from the Smitten Kitchen – and not because of the baby picture, but that’s pretty awesome too. There you have it, a whole lot of ring shaped foods. I’ve surely missed some good ones. However, I think this is a perfectly adequate start to the celebration.